Kate Foster: The image here is called ‘Deer of the World’. It arose from doing research about extinct Blue Antelopes. I learnt that new nations have developed military camouflage patterns in order to forge identity, apart from military purposes. They have also hunted deer and antelope for millennia. Today scientific illustrations of these animals habitually have them facing right. 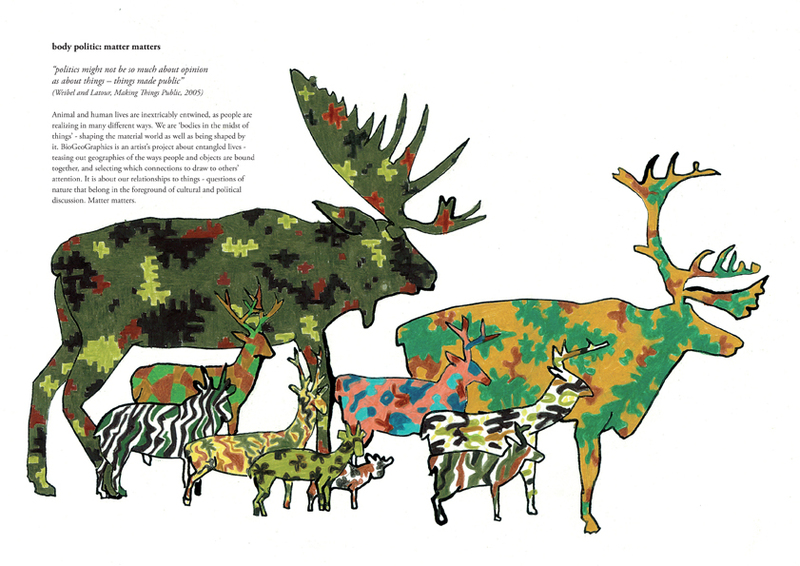 In this drawing, each sports its own camouflage. I am going to describe briefly my project BioGeoGraphies, undertaken as an independent artist. This work looks at networks of relationships around specific animals’ lives that have become, in some way, entwined in my own – animals that are good to think with. It is about entangled relationships between people and things; assemblages of things; technologies – not just looking at human activity in isolation. This extends ideas of what should be included, I think. I am thinking about ‘Working in Public’ and its focus on the human. But I leave discussion about how ‘people are in the midst of things’ to theoreticians such as Bruno Latour and instead talk a little about BioGeoGraphies. This project is a process of teasing out geographies of animal existences through time and over space. It involves selecting certain connections to draw to our attention. Interventions like transporting a museum specimen or building a website open up discussion about the ways that people and things are bound together. The projects have an eye towards environmental politics, for example, about how large parts of Scotland are managed as moorland that is used for hunting. The projects are arenas where questions of nature turn into political and aesthetic issues. It is about letting affairs become more complicated, not letting issues polarise. This can mean that it does not easily fit into organisational policies and strategies. I set out to find people with shared interests and who are deliberately disrespectful of disciplinary boundaries. The main point is to make conversation. Material outcomes are relatively slight: small scale exhibitions, book works, the website – but there is a gradually extending network involving people with different kinds of experience and knowledge of topics and questions: a museum curator, archaeologists, a poet, taxidermists, the late Duchess of Westminster’s salmon ghillie, biologists and, in particular, cultural geographers – notably Hayden Lorimer and Merle Patchett at the University of Glasgow. Now for something about the Blue Antelope itself. Glasgow University has one of only two skulls in the world of this animal. The Blue Antelope was exterminated in the 1800s by European settlers in South Africa. The only other skull is in Amsterdam. I am going next month to South Africa near where it used to live. I will find scientists who study it, but I am unlikely to an African name for this animal because the culture of the people who knew it when it was alive, has also been exterminated. Perhaps I will find out more about why it was called ‘blue’. For good curatorial reasons, the museum curator cannot let me take the Blue Antelope’s skull with me, but she is letting me travel with the skin of a Common Swallow. It took more than a few phone calls to clarify a dead Swallow’s status regarding import licences. They migrate each year to and from South Africa and Britain. I want to know its name in the other South African languages. Again, there is a reference to environmental politics. Expansion of the Durban Airport for 2010 FIFA World Cup may possibly knock out reed-beds that the swallows use on migration. I am sure to find a whole range of sensibilities and priorities in South Africa. In summary, to return to the idea that ‘matter matters’, BioGeoGraphies works with the idea that people are bodies in the midst of things. Doing BioGeoGraphies is an oblique way of becoming sensitive to environmental justice. It is simply one way to work creatively within the disparate approaches and relationships people have with the non-human world. It is not exactly activist art, though working creatively with others helps to engage. In practising as an artist, I advocate a shift of aesthetics towards make-do, opportunistically using local resources and working on local connectedness. I pay attention to the technological apparatus of putting work out in public. I also have recently bought a long-haul plane ticket.